Europe's Automated Transfer Vehicle, the third in a line of five robotic cargo haulers, glided into the aft docking port of the International Space Station on Wednesday, delivering a heavy load of supplies, food, rocket fuel, air and water to keep the 450-ton complex running at full capacity. Cargo delivered by European and Japanese resupply missions is crucial after the space shuttle's retirement. NASA is waiting on U.S. commercial logistics vehicles to begin flying this year to ensure the lab's crew continues churning out a steady flow of scientific discoveries beyond 2013. As big as a double-decker bus, the 20-ton spaceship approached the space station with GPS satellite navigation and state-of-the-art lasers, which supplied precise range and positioning information to the ATV's on-board computers. Visible only by its navigation lights, the craft appeared to hang in the blackness of space as it orbited on the night side of Earth, conjuring an image from a sci-fi production. When the space station and visiting freighter passed into sunlight, the ATV's white thermal blankets went from dark, to orange to bright white. And the ship's X-shaped solar arrays appeared, resembling an X-wing starfighter from the Star Wars film franchise. Docking occurred at 2231 GMT (6:31 p.m. EDT) over American Samoa in the Pacific Ocean. Less than 10 minutes later, the cargo craft's docking probe retracted, hooks latched, and electrical cables were connected to make the vehicle part of the space station. "The contact was very soft," one of the space station astronauts radioed mission control in Moscow. "We didn't even feel it." 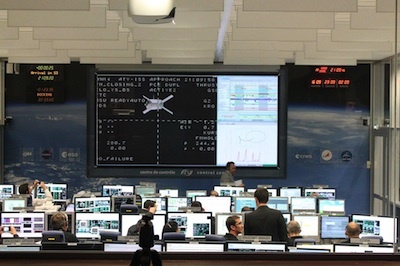 The ATV was closing on the space station at a glacial 2 inches per second in the final moments before docking. "We congratulate everyone on the ground with a very successful docking," one station resident said. 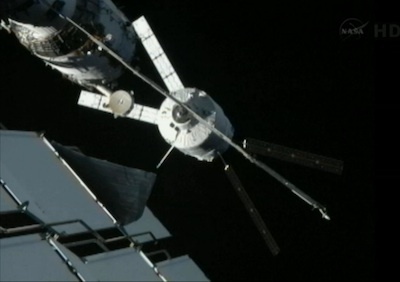 "It sure is nice to have ATV 3 on-board," radioed Dan Burbank, commander of the space station. Named Edoardo Amaldi after an Italian physicist and space pioneer, the resupply freighter will stay at the space station until late summer. Edoardo Amaldi is the third Automated Transfer Vehicle built by EADS Astrium for the European Space Agency. After Edoardo Amaldi and previous ATV missions in 2008 and 2011, two more cargo freighters are under construction for launch in 2013 and 2014. Each mission costs about 450 million euros, or approximately $600 million. "No one should consider that this smooth and gentle docking between these two giant spacecraft is either an easy or routine task," said Thomas Reiter, ESA's director of human spaceflight and operations. "The technologies we have demonstrated in operational conditions with the ATVs have a tremendous potential for future human spaceflight and exploration missions." The space station crew planned to open the hatch leading into Edoardo Amaldi on Thursday and test the atmosphere inside the craft's pressurized module. Unloading of 4,800 pounds of fresh food, clothing, crew personal packages, experiments and spare parts will begin Friday, according to NASA. "There are about 160 cargo bags of different sizes, so it's really a mix of everything," said Massimo Cislaghi, ESA's ATV 3 mission manager. "There are crew supplies, there are spare parts, experiments, everyday items." It will take more than 80 hours to remove all the equipment packed inside the ATV's cargo carrier and restow the cabin with garbage for disposal. The space station crew and ground controllers will also transfer 220 pounds of oxygen and air, 75 gallons of water, and 1,900 pounds of rocket propellant for the lab's Russian segment. The ATV's main cargo-carrying compartment has a volume of nearly 1,600 cubic feet. Hatches between the Zvezda service module and Edoardo Amaldi should remain open throughout the craft's stay. The ATV is scheduled to depart around Aug. 27, but the date could change.